I’ve been working a lot on re-furnishing and expanding a few of my characters’ houses lately, so I thought I would give an overview of what I’ve done for each of my characters and their houses to this point, and what my goals are for each of them. I’ve especially focused on Estel’s and Lyra’s homes recently, which have both been changed into castles! ^_^ I thought that having a few castles in my fantasy city would be fitting, but that having every single house be a castle would be over-doing it, so Violet’s and Fern’s homes will be more humble, cottage-style houses. First I added left and right wings so that I could get the mansion exterior, which is required in order to buy one of the architectural upgrades from Nook’s Homes (the zen castle/castle/modern house). The regular mansion doesn’t look bad at all, and I can always go back to it if I want to, since the mansion structure is also sold at Nook’s Homes. But I’m pretty happy with how the castle version turned out! Eventually I’d like Estel’s castle, garden, and pretty much the entire side of town her home is located on, to be designed and landscaped to look best at nighttime, with lots of whites and cool colors. The main room is still similar to what it’s been like for a while, cloud-themed with regal furniture. It’s supposed to give the impression of something like an entrance hall rather than a bedroom with a complete series. I added some tables on the sides that have music box versions of Forest Life, Stale Cupcakes, Only Me, and K.K. Swing, so there’s a few choices on what you can listen to. I’m using regal furniture in the upstairs room as well, but unlike the main room, I’d like for the upstairs room to be a nighttime-themed bedroom for Estel, with the lunar horizon wallpaper (I don’t have it yet) and other furniture I think would be fitting, like the star globe, aurora screens, maybe September’s new DLC of the full moon vanity, etc. The room is far from complete and it’s already feeling cramped, so I’ll probably have to expand it to the full size. The left wing is a library made with white rococo furniture. And so far, the right wing is a bathroom… just something easy to fill up this small space. Lyra’s fairy-tale house with the mansion exterior. And now it’s of course a castle! Lyra’s castle is located on the busier side of town with the train station, town hall, Re-Tail, and many villager houses. Unlike the side of town with Estel’s castle, I’d like for Lyra’s side of town to look best in brighter conditions with lots of vibrant hybrids and fairy-tale themed projects. You could maybe say one side is the city of the moon (ruled by Estel) and the other side is the city of the sun (ruled by Lyra)… er, we’ll see how it turns out, but it’s at least a feel to strive for in the future. 😛 Right now, though, I’m definitely sacrificing current aesthetics for the sake of growing hybrids, so that I can better decorate my town in the future. I’m not 100% sure what to do with the interior of Lyra’s house yet. I’d like the interior to at least somewhat match the exterior of the house, but there isn’t an exactly matching “fairy-tale” furniture set to match the exterior decorations. What I’m going for is a grand feel to match the castle exterior, but also with a more whimsical feel (ie. I think the elegant white furniture in Estel’s house would be too “plain” for Lyra’s house), and maybe a color scheme of pink, blue, and gold. Feel free to give suggestions if you have any! This is my attempt at making a sort of throne room/entrance hall to Lyra’s castle, using jewel-customized furniture, stained glass windows, and stained glass lamps to change the lighting (so that the mosaic wall and tile will match the furniture better). I thought sapphire- and ruby-customized furniture would especially match the fairy-tale decorations both in grandeur and in color scheme. Unlike the two castles above, I’d like for Violet’s house to have a quaint cottage-in-the-woods feel. I’ve made a lot of progress on getting the exterior of her house the way I want it, but that progress might be put to waste because I’m considering moving her house to another location (a more forested location). Her house is near the waterfall that meets the ocean, which at the beginning of the game seemed like a great place to put a house, but now I’m realizing there might be a better place for it. So I’ll probably move her house soon because in the long run, I can re-do the expansions and re-collect the house parts, and her house will be in a more fitting location. This room looks kinda messy because of the mix of different themes (ranch, alpine), but eventually I’d like it to be a cozy kitchen/living room. There are lots of cute little kitchen-themed items to put on the walls in this game that I’m eager to use! I dream that one day Fern’s house will be a cobblestone cottage on the edge of this cliff overlooking the sea, but it will probably be a while before I can start making any progress on it. 😦 The reason for this is I’m using Fern’s character as my villager-house scout, which means that on days I’m expecting a new villager to move in, I delete and re-make her character, resetting until I get a house plot in a decent location. I feel forced to do it, I just can’t deal with having houses randomly land on gardens and paths and areas I’ve worked hard on. Hopefully one day I’ll have all my dream neighbors in locations I’m happy with, and then I can start to work on Fern’s house (both the exterior and interior) more. The path to her house is one of my neater dirt paths, I think! Most of them are extremely messy and unfinished right now. Well, that’s it! My characters’ houses are still far from complete, and my catalog still has a lot of growing to do before I’m satisfied with the interiors, but I’ve been spending a lot of time and bells on their houses lately (lots of beetle-hunting, catalog-ordering, waiting on Cyrus to refurbish things, and so on), so I felt like sharing my progress. 😛 Feel free to give me feedback, ideas, and suggestions! I’ll save my screenshots of recent everyday-happenings for another post. Posted on September 7, 2013 by Amy •	This entry was posted in AC:NL, Citalune and tagged Animal Crossing. Bookmark the permalink. Wow! Your town’s been improving! Mine is still under construction for now.. so my update on my town will have to wait.. 😛 I love Estel’s house! It’s so elegant! ^^ I really love the rococo furniture! The castle on Estel’s house is lookin’ good! ^ ^ Especially the night time shot you took of your whole entrance, plus the castle. It’s gorgeous!! I like your idea of the choice of music that’s playing, too. I always put into consideration the music that’s playing in each room, say of a model house, to help me determine whether I like the room or not. It’ll be a lot easier to say I like the room with a few choices of songs – plus, it’s nice that they’re music box-ified, since I haven’t heard very many of the songs in a music box yet! I like how you put plants in your bathroom area, it’s a nice touch! Estel’s house reminds me of a VERY high-class hotel, as of now! Lyra’s house is awesome from the outside, too! Curious question – are you planning on putting any PWPs into your exterior? You did say castle themed, but did you mean fairy-tale stuff? I like the way it is now, (with the pink and gold roses matching Lyra’s house), however if you could find a PWP, (even something as simple as a bench out front), I think it would be a nice addition. A suggestion for the interior of Lyra’s house was to incorporate ruby-lovely and sapphire-blue furniture, (like you have in your picture), into your house, as well as gold furniture. This idea would work out if you wanted to have a sort of stain-glass, royal, pink-blue-gold idea for your house. 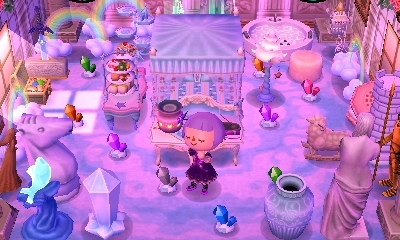 (^-^d) Also, if that’d be too much furniture, I like the idea of just having the amethyst-modern furniture and golden furniture in your main room. However, whatever you aspire to do with that room, I think the mosaic wall and floor have to go – they’re almost too dull for that room, and they don’t match much. I think you need a plainer wall and floor, because the jewel/golden furniture already pops by itself – if that makes sense? LOL I never thought of a mermaid-themed bathroom! That’s so cute! :3 Does Lyra live by the ocean? 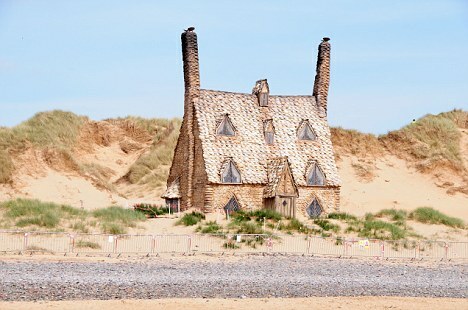 I know you’re still moving around Violet’s house, so maybe if nobody lives by the ocean currently, and if you’d like to keep up this idea, then maybe you could make a whole ‘nother house with an ocean-theme. For a ‘quaint-cottage’ feel for Violet’s house, I wouldn’t use ranch. In my opinion, I would use cabin to make it cottage-y, and alpine with a custom design that could match her house. I agree with you on Fern, and that’s why I don’t know if I’ll ever make a fourth player. However, your path is really neat! I wonder how long it would take to do something like that, because it’s so precise to your flowers! :O Maybe Fern could be the ocean-themed house after all? Thanks so much for all the feedback! 😀 It’s great to have all these new ideas and opinions to consider as I continue to work on shaping my town, instead of just relying on my own point of view. In New Leaf I thought I’d try to go for a fairly unified feel for each of my characters’ houses, as if it were a real house, each room matching a similar overall aesthetic, but each with a different purpose (a library, bathroom, bedroom, kitchen, etc.). And I was also hoping that the inside of the house could match the outside, like in Fern’s future cobblestone house I was thinking of having wallpaper that looked like stone. But I guess even though this would make the houses seem more realistic, it’s also fairly limiting, and could seem repetitive having the same sort of style throughout an entire house. Lyra’s house is nowhere near the beach (it’s actually near the train tracks), but from browsing guides like this, I found out that there are certain series and items deemed “fairy-tale,” and mermaid is one of them, so I thought why not throw a mermaid bathroom in Lyra’s fairy-tale house? I also wondered if the mermaid series would meet the grand/fancy yet whimsical feeling I’m going for in her house, and it even sort of has a pink and blue color scheme. I don’t know, though, you’re right that a mermaid room would be more fitting in a mermaid-decked-out house by the beach. Thanks a lot for the ideas for different rooms in Lyra’s house! 😀 I wish I had more blue series items, they look gorgeous when turned sapphire imo. Maybe you can move the mosaic into another room, because I do see why you’d want to use it. It still could be like a church-based, maybe, kitchen? Or even just a quiet reading/living room-type-thing? 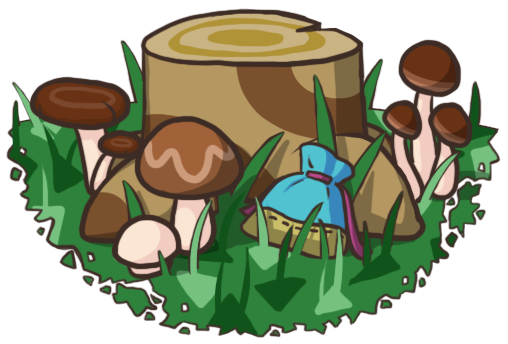 Oh, good idea for the Town Tree being the center of the forest type-thing! 🙂 Don’t know if you play Pokémon, but the idea of the Celebii statue somewhere in the forest would be neat too! :3 I do like what you have in mind for Violet’s house…it would be neat to have it surrounded, and especially in that location that you’re thinking, since it looks like your worst enemy in the location she’s in right now is space around the house. Ooh, awesome, that’d be great! 😀 I’ll take a look at your wish list and see if I can help you out as well. Btw, the blue series items I have are the blue wardrobe and blue dresser, and the carpet and wallpaper. Haha yeah, I remember that plot-line from… Pokemon silver, I think? xP My plans for the forest (other than having lots of trees) are hazy at this point; if possible, I do hope to make it a magical-feeling sort of forest, with violets and mushrooms scattered around. Thanks so much! I feel bad, I only had a few things on your wish list. Feel free to let me know if there’s anything else you want in the future, since I owe you a lot for this! Sure! I’m seeing this at 6:51 PM, so I hope that there’s still some time tonight and that I’m not too late. Alright, cool! 🙂 Who should open gates? Wow, I missed out on a lot during my week away from internet! (I’m doing a practicum for my degree at the moment so I’m out for the whole week.) I visited dream Citàlune this morning and it was gooorgeous x3 Needless to say, Estel’s and Lyra’s new castle homes look fantastic. It’s a very interesting idea, to optimise a landscape for nighttime viewing, and I think also a very challenging one. Good luck with that and it looks great already! The interiors you’ve shown look amazing, too. 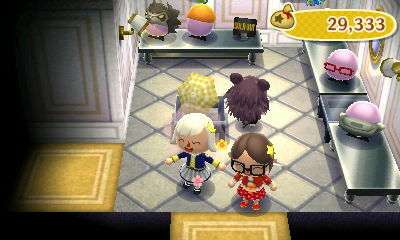 My favourites are Estel’s main room (the view from behind is oh-so fluffy and heavenly x3) and her bathroom, haha. I’m going for the same kind of feel (Rococo/whitish + gardeny) for my main room. The dirt paths are going well. It’s interesting the way the path to Fern’s house is zig-zaggy like that. Do diagonal paths do that naturally? I would have expected it to get all thick and messy since you’re sort of treading across two squares for each step. I saw that we’re going for a similar feel (not that I was trying to copy you or anything), and I love your white Rococo room too! The Venus de Milo statue in there really adds a lot, and it works well with the palace wall 😀 Buying art from Redd for decorative purposes is a good idea, sometimes I forget we can’t order art anymore. 😦 And now we can order Gulliver items and stuff, it’s kind of weird! Now that Gulliver is so easy to catch, I would have preferred if they kept his items as unorderable 😛 Would have kept the novelty of getting his souvenirs. Yeah, I’ve ordered a few Gulliver items from HHA houses and it feels strange, it kinda de-values his items a bit. 😕 I remember being proud of collecting multiples of his statues in AC:WW, so I could have a statue room 😛 Now you can just easily order multiples with the catalog. I actually do walk through it in a zig-zag fashion, just to be safe in preserving one of my neater-looking dirt paths. It’s not the most convenient, but there’s also not a huge need to be going to Fern’s house much. If you do the day/night thing you should decorate Lyra’s house with some sun cosmos!